HA NOI (VNS) — Vietnamese shares declined yesterday on both local exchanges after the State Bank of Viet Nam reduced the saving interest rate for US dollar saving accounts, which hurt bank shares. The benchmark VN Index on the HCM Stock Exchange yesterday dropped nearly one per cent to close at 564.88 points. The HNX Index on the Ha Noi Stock Exchange lost 0.7 per cent to finish at 78.15 points, ending an eight-day winning streak that saw the index jump 2.7 per cent. Yesterday, the State Bank of Viet Nam cut the dollar saving interest rate from 0.75 per cent to 0.25 per cent for individuals and from 0.25 per cent to 0 per cent for businesses. The central bank said that its move aimed to ease pressure to devalue the Vietnamese dong, after China's sharply weakened its currency recently and the US central bank plans to raise the interest rates later this year. Since the beginning of this year, Viet Nam's central bank has depreciated the dong by five per cent against the dollar. "Money may flow towards the securities market or the property market or even gold," Do Thien Anh Tuan, lecturer of the Fulbright Economics Teaching Programme, told vnexpress.net website. "However, the switch should not be large." However, brokerage VNDirect Securities JSC wrote in its report that the move could also make foreign investors withdraw their money from local financial markets. Following the central bank's move, the banking sector yesterday fell 1.9 per cent – the most declining one among 23 sectors on the stock market - with all of the nine listed banks down. Vietcombank (VCB) lost 2.3 per cent, the Bank for Investment and Development of Vietnam (BID) was down 2 per cent and Vietinbank (CTG) dropped 1.5 per cent. In addition, the energy sector also contributed to the market's decline as it fell 1.8 per cent after US crude benchmark West Texas Intermediate yesterday fell 0.9 per cent from last Friday and traded at $45.28 a barrel. None of listed energy stocks gained. Petrovietnam Gas Corp (GAS) lost 2.5 per cent and Petrovietnam Drilling & Well Services (PVD) dropped 2 per cent. 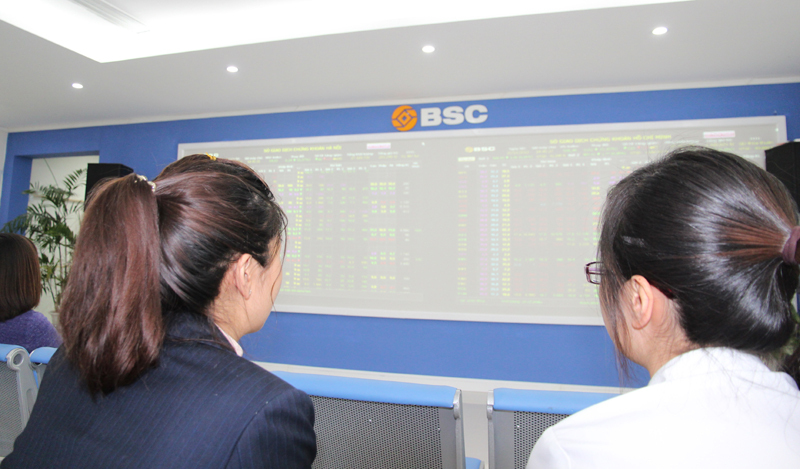 Insurancer Bao Viet Holdings (BVH) lost one per cent and brokerage Sai Gon Securities Incorporate (SSI) dropped 2.5 per cent. Total 117 million shares were traded on the two local markets yesterday, worth VND1.82 trillion ($81 million), a decrease of 18 per cent from last Friday.